Walk Score ranks 2,508 neighborhoods in the largest 40 U.S. cities to help you find a walkable place to live. What makes a city walkable? See here for side-by-side comparisons. Methodology. Walk Score just launched walkability maps and rankings for the 40 largest U.S. cities. Washington, DC ranks 7th (between Seattle and… Long Beach?!?!) Baltimore is #12. Dupont Circle, our highest scoring neighborhood, is 17th among all neighborhoods, though 12 of the higher ranking ones are all in Manhattan (the others are San Francisco’s Financial District and Chinatown, Portland’s streetcar-developed Pearl District, and Old Westport, Kansas City. Ten DC neighborhoods break a 90 and win the label “walkers’ paradises”: Dupont, Logan, Downtown, U Street, Foggy Bottom, Mt. Vernon Square, Adams Morgan, Kalorama, Friendship Heights, and Georgetown. The map shows what we intuitively know: the row house part of the city is very walkable. 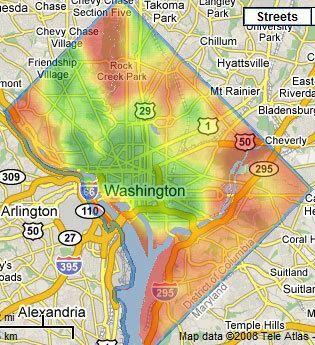 To a lesser extent, so are the main retail concentrations elsewhere, like Wisconsin and Connecticut Avenues, Takoma, and Brookland. We don’t do better in the overall rankings (just above Long Beach and Los Angeles) because of large swaths of unwalkability around the perimeter of the city, especially in Northeast and east of the river. The algorithm still is far from perfect, but it does a pretty good job of quantifying what areas are more or less walkable. I’d quibble with the neighborhood breakdowns, especially outside the center; they label Crestwood and 16th Street Heights as “Petworth”, and Petworth (plus Park View and others) are lumped in with CUA-Brookland. Likewise, the area labeled Takoma Park is west of Georgia Avenue, making it more Shepherd Park, with the actual Takoma area in Fort Totten-Upper Northeast. And the entire area east of the river, except Deanwood, is “Anacostia”. Getting decent neighborhood boundaries is remarkably difficult, as there are no official lists of neighborhoods (except in a few cities, like Chicago). I tried once in a pervious job, when building a service to find restaurants over the phone. We wanted to let users say a neighborhood, but it was nearly impossible to get a decent list of neighborhoods for even major cities nationwide.